The pendulous ears, soft gentle expression, sturdy build and friendly, wagging tail proclaim the English Springer Spaniel unmistakably as a member of the ancient family of spaniels. It is the largest of the land spaniels and was originally used to find and spring game for the nets, or the falcon carried by hunters. This ancient breed of dog normally lives to 10 years of age, but kept in a loving and caring home and given the right food can live up to 12 years of age. 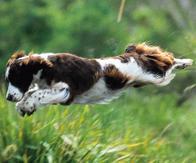 Every inch a sporting dog, the Springer is a tireless worker in the field with great tenacity and endurance. The English Springer Spaniel is probably the best choice for any sportsman who wants one dog only, as an all purpose gundog.The Springer is actively represented in obedience, agility, field trials and conformation shows. A people's dog, the Springer thrives on human companionship. Playful and patient with children, it loves nothing better than romping around and taking part in their games. Although normally quiet, the Springer nevertheless makes a good guard dog. Springers need human companionship, although they can snooze all day while their owners are at work as long as they get sufficient attention and exercise when the owners are at home.It needs as much hard exercise as it can get, and it thoroughly enjoys the chance to have a swim. It should not be shut out in the back yard and left to its own devices. Puppies, in particular, get very bored and wilful if deprived of company. The coat of a Springer requires attention on a regular basis. Clipping for pet dogs can be confined to the inside of the ears and around the tail. This makes it easier to keep both areas clean. Hair must be trimmed from between the pads of the feet. Without this care, the feet can splay, and the dog loses traction on slick surfaces. Daily brushing or combing is strongly recommended. 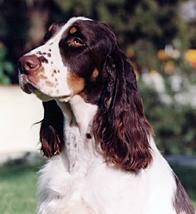 Some Springers develop allergies to fleas and certain grasses. Those who are prepared to give their dog plenty of attention.